Couples choose to elope for lots of reasons! Some choose to elope because they want their wedding day to be just about them. They want a stress-free day to focus on each other and maybe a handful of guests or just their immediate family members. Some choose to elope because they're looking to save money and maybe splurge on the honeymoon instead! Some choose to have the adventure of a lifetime and eloping is part of the big trip! 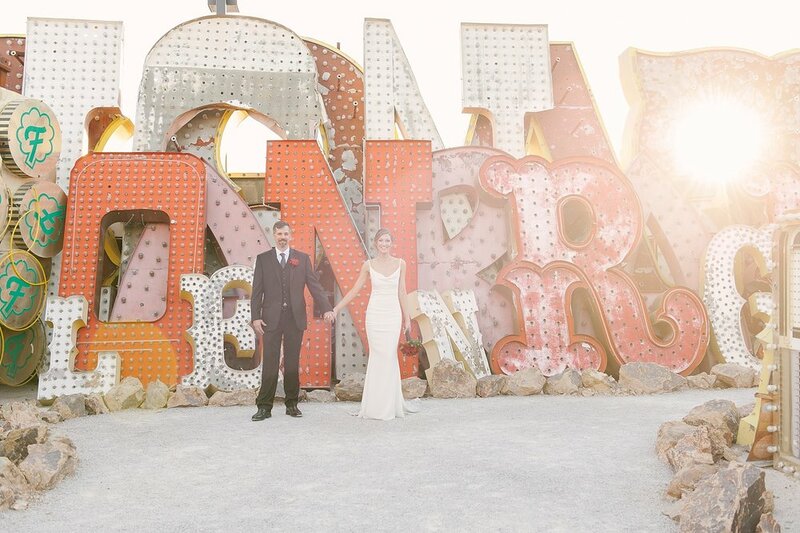 Whatever the reasons, eloping in Las Vegas is a great idea and it doesn't have to be cheezy or tacky! And it definitely doesn't have to be in a chapel either. 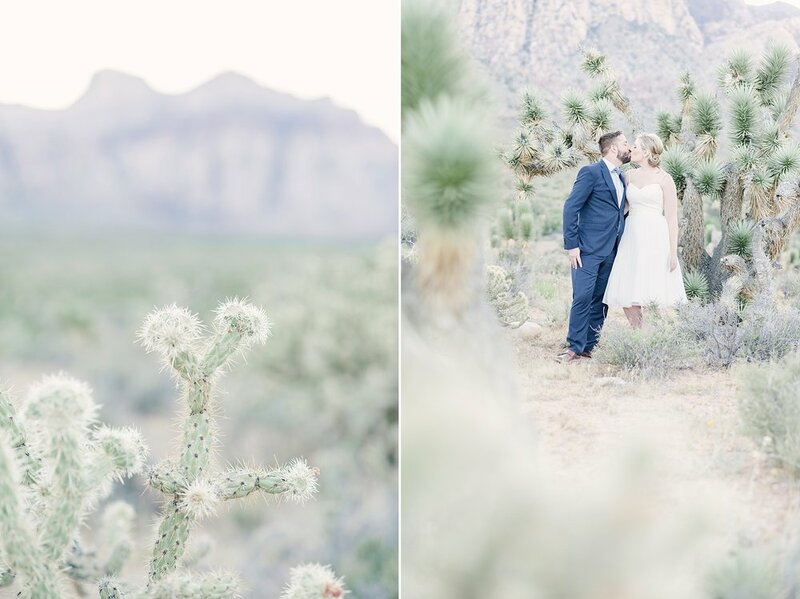 Las Vegas offers lots of options on how to personalize your elopement and have it be the best day ever! We absolutely love photographing elopements. They're always so fun and relaxed, and are so full of emotion and intimacy. After the ceremony, when it's just the 4 of us, there's no pressure of getting done in time for the reception. It's just us capturing their love and documenting their first moments together as Mr. & Mrs. Location: Downtown Las Vegas | Bouquet: Layers of Lovely | Makeup: Amelia C. & Co.
Venue: Neon Museum | Florals: Miss Daisy | Hair & Makeup: Amelia C. & Co.
1. Location. The first thing to consider is where to have your ceremony. Sure there are tons of chapels out there and they're pretty low-hassle. However, most of the chapels are windowless and the decor is not the most modern. The ceremonies are also quick and generic, even Elvis has a script and his go-to songs ;) If you prefer a more modern + intimate approach to your ceremony, you have plenty of other choices, such as the dry lake bed, the gorgeous desert, a quirky spot in downtown Vegas, the Neon Museum, or even a traditional venue such as a country club can host a small, intimate ceremony. Each of these locations offer a gorgeous backdrop for your ceremony and require little to no need for additional decor or enhancements. 2. Officiant. Once you find a location that is perfect for you and your love, you'll need an equally perfect officiant; someone who will take a personal interest in you and your fiancé's love story and incorporate that into a meaningful ceremony. We highly recommend Peachy Keen Unions! They are modern marriage officiants who's mission is to "collaborate with couples, creating and performing personalized ceremonies", including elopements! Another favorite is Pastor Doug Loman. He is very personable and also works with his couples to help create a personal and meaningful ceremony. 3. Details. Once you know where you'll be married and who's going to officiate your ceremony, the rest is up to you! There's the obvious things to consider such as your dress, shoes, hair & makeup, oh and his suit too. Then there's also the logistical things to consider, such as transportation and picking up your marriage license. But then there are the little details you add to make your elopement beautiful and most importantly, personal and all your own! From special touches incorporated within your own wardrobe to bringing special trinkets or mementos. Writing your own vows is super special and because you're eloping, you won't have to be nervous about saying them in front of a lot of people. A pretty bouquet goes a long way! Think of it as a gorgeous accessory. And, since you aren't spending tons on decorating a reception venue, you won't feel guilty about splurging a little on some florals! Lastly, don't forget the bubbly! Whether you're toasting with a few friends or family who came along or it's just the two of you, after saying, "I DO!" is the perfect time for popping open a bottle of champagne to celebrate your love! Michelle and Barnard chose to exchange their vows in the middle of the Brooklyn Bridge in front of the New York New York Hotel and Casino on the strip. For them, Las Vegas was more of a strategic destination than anything else. Being busy successful restaurant owners in Pittsburgh, these two were ready for some R&R and chose to honeymoon at one of the most beautiful locations on the planet, Fiji!!! A flight from the east coast to the far Pacific is quite the trek, so they decided it was best to get married on their way to the honeymoon and Vegas fit the bill of being on the west coast and a fun spot to tie the knot. I just love how these two think! Like seriously, we could be travel soul mates! 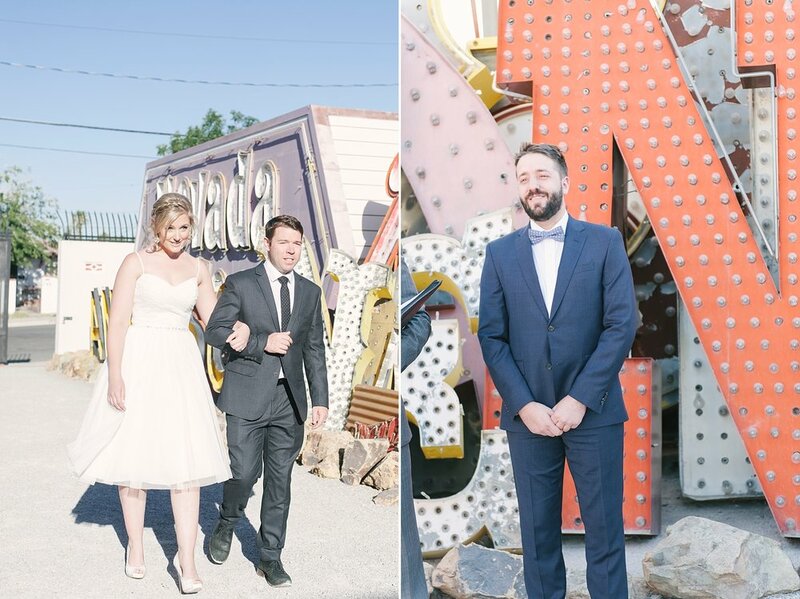 After their I Do's we walked around NY NY and then made our way to the Neon Museum to end their session! 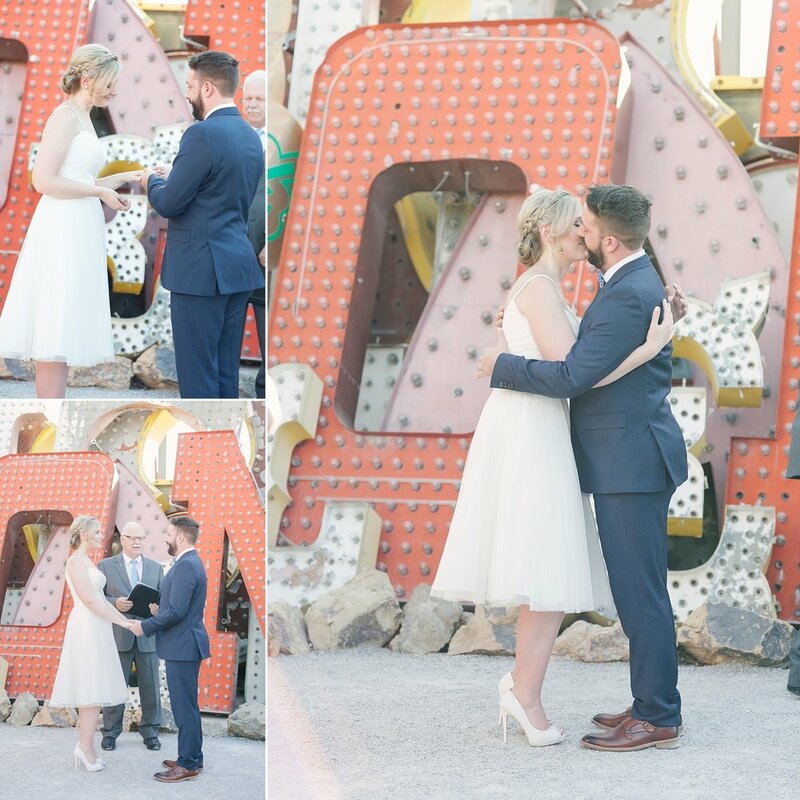 Have I told you how much I love the Neon Museum for wedding photos?!? It's such a unique spot for destination weddings and really has that vintage Vegas vibe that so many people love. We had so much fun chatting and walking around with Michelle and Bernard. We got to witness their love and document one of the best days of their lives, followed closely I'm sure to landing in Fiji ;) Yes, I may have wanted to sneak in their suitcase and tag along! M+B: We wish you nothing but success, love, and adventures in your marriage! Congratulations!! Laura and Kyle had their wedding ceremony at one of our favorite venues for small weddings and elopements! 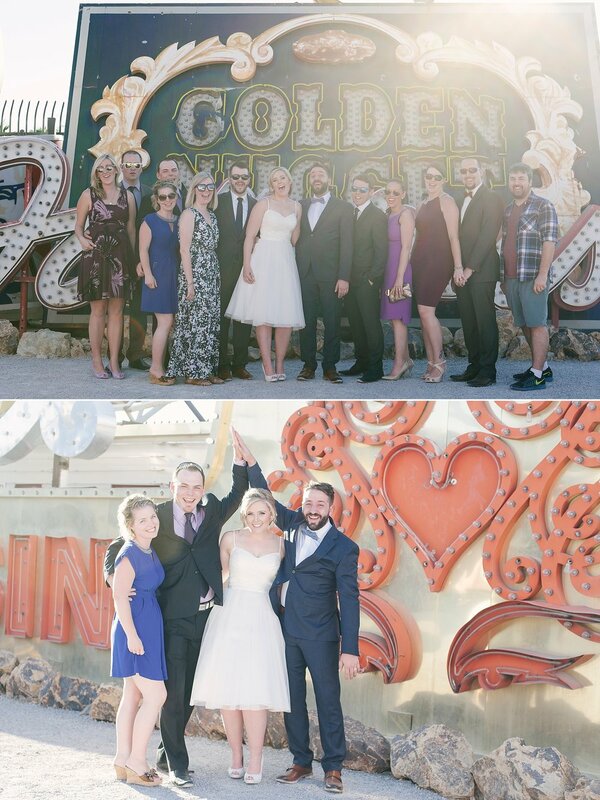 They came from Canada with a small group of their closest friends to tie the knot among the old signs of The Neon Museum. It's the perfect venue for a private ceremony and portraits if you're looking for a fun vintage vibe. Laura and Kyle wrote the sweetest vows to each other and that really made their ceremony so special! After they sealed it with a kiss, we spent some time getting some great shots among the signs and letting them enjoy the first few minutes of being Mr. and Mrs. Afterwards we made our way to the desert for more portraits of Laura and Kyle. 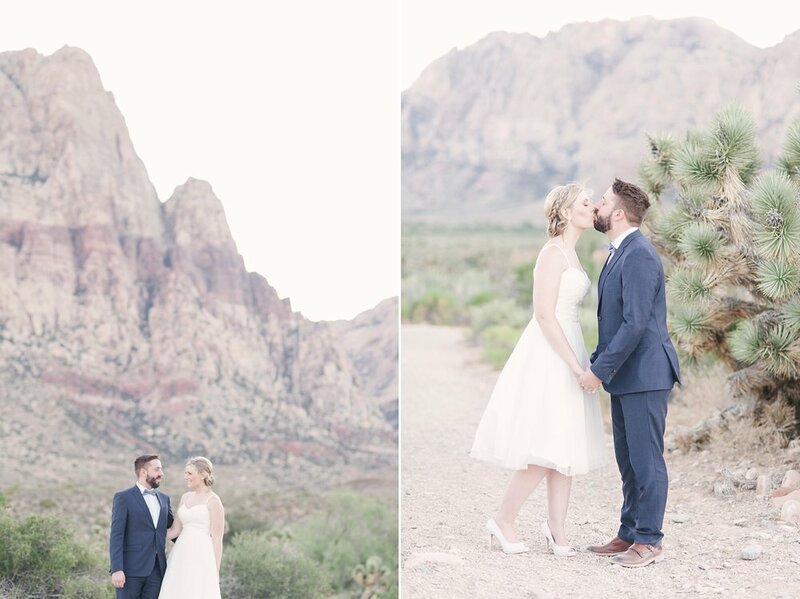 Although the backdrop was totally different, they still kept it very Vegas with the mountains and joshua trees. We had the best time with these two and are so happy we got to be there for them on this amazing day! L & K: Thanks again for having us! We hope you had an amazing honeymoon traveling up the coast of California! Congrats!! !